Paradise Garden Lighting’s GL22720BK 12-volt starfire floodlight is the sturdy and stylish solution for highlighting your home’s favorite landscaping or architectural details. With a tool-free installation process and a durable cast aluminum construction that can withstand the elements year round, the starfire’s 50-watt floodlighting capabilities deliver a maintenance-free means of putting your birdbath, water feature, front porch, or entryway on display at night. Combine multiple starfire floodlights to illuminate pathways or patio and deck areas to provide mood lighting while entertaining outdoors. With the GL22720BK 12-volt starfire, your exterior floodlighting options are endless. 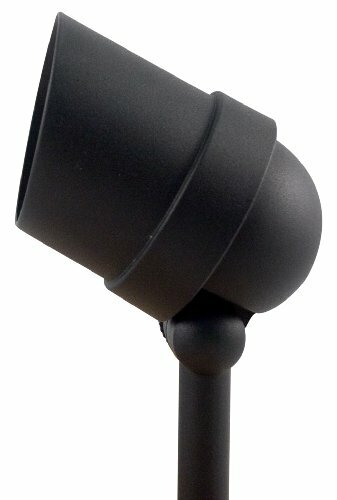 Paradise Garden Lighting's 12-volt starfire floodlight is equipped with 50 watts of lighting power to highlight exterior focal points (view larger). 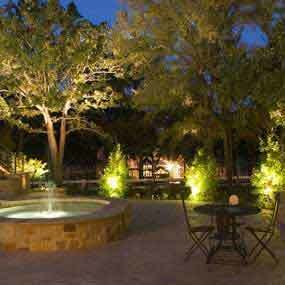 Combine multiple starfire floodlights to create a soft glow for outdoor entertaining (view larger). While the 12-volt starfire floodlight is low-voltage, it certainly packs a punch when it comes to its 50 watts of lighting power. 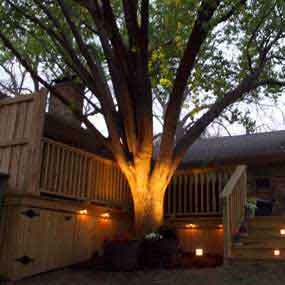 You can customize exactly where that bright light is cast by adjusting the fixture on its 180-degree flexible neck, pointing it upward to highlight a raised bed garden, a front porch sitting area, a backyard pool, and other landscaping and architectural focal points on your property. The durable cast aluminum construction and protective glass lens are built specifically to withstand the elements regardless of seasonality, providing a maintenance-free and worry-free exterior lighting solution. Installation is tool-free and straightforward. 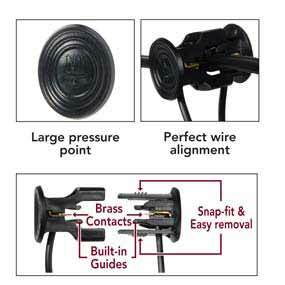 An ergonomic snap-fit design and large pressure points make for easy setup. A quick-clip connector connects the starfire wire to 16-, 14-, and 12-gauge wires, and built-in guides allow for perfect wire alignment from the get-go and allow you to connect a system of floodlights quickly, safely, and easily. One Paradise Garden Lighting starfire 12-volt floodlight in black, 12 inches of SPT-1 18-gauge wire, one connector box, and one 50-watt halogen MR16 light bulb.